These free DIY TV stand plans will help you build not only a place to sit your TV but also a place to store your connected devices and media. You'll even get to do it in your own style, there are plans for a farmhouse, rustic, modern, contemporary, and industrial television stands. The woodworking plans are available in a variety of sizes so you can choose one best for your space, whether that be in your living room or a smaller room. They come in different heights as well so you can get the best view from your couch or your bed. The plans vary in skill level, some are appropriate for the beginner woodworker and others take a bit more experience. The cost of each varies as well, depending on what type of wood, hardware, and finishes you choose. All the plans are complete plans that include diagrams, color photos, step-by-step written directions, as well as lists for shopping, materials, and cutting. Many also include photos, comments, and even videos submitted by people who used the plan to build their TV stands. If you're looking for something more substantial for your TV, check out these free entertainment center plans. This free media cabinet plan from Build Something is in a slightly rustic farmhouse style but it certainly can add different hardware and paint to give it a more modern look if you'd like. It features plenty of storage with double shelves behind glass doors and has a nice sturdy service for you to set your TV on. This is a complete plan that includes diagrams, photos, written instructions, a tool list, materials list, and parts/cuts list. There's even a link to a video to show you how to get a similar white-washed weathered oak finish as shown in the photo. Shanty 2 Chic has created a free DIY media console plan that includes both open shelving and closed shelving behind two doors. It's finished in a rustic style but with less distressing, you could give it a whole new look if you'd like. The free plans include diagrams, color photos, a tool and materials list, and even a video that shows it being built. This free DIY TV stand plan from Ana White includes small sliding barn doors, giving you the flexibility of both open and closed shelving. This is a very flexible plan and you can look at hundreds of user-submitted project photos to see how their small changes completely change the look of this console. You'll find color photos, diagrams, and step-by-step building instructions to make building this a smooth experience. Remodelaholic has created this simple TV stand plan that has two open shelves and details like planks and X frames to make it a great looking piece of furniture that you'll use for years to come. You'll find a tool list, materials list, cut list, building directions, diagrams, and photos to help you along the way. 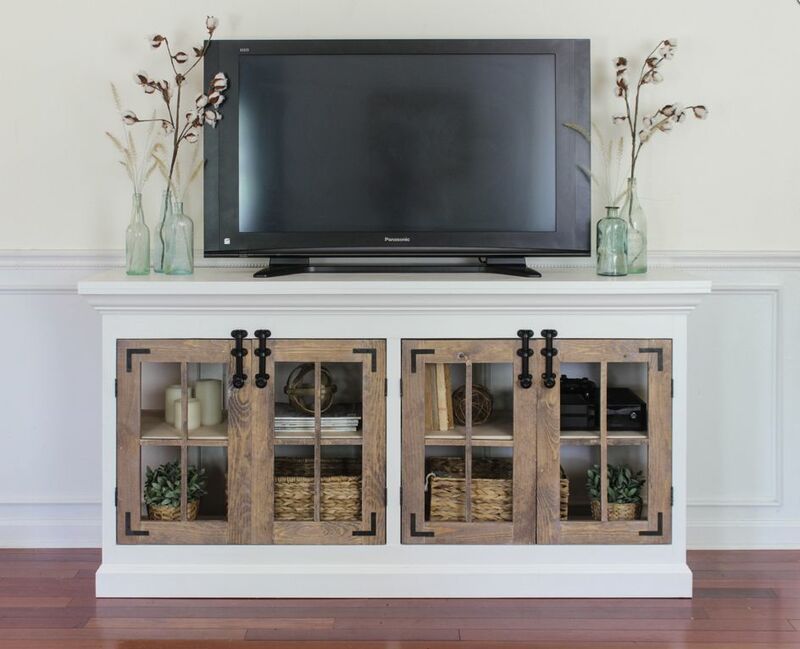 Here's another free TV stand plan from Ana White, this one called the Rustic X console. Two large shelves for books or anything else gives you lots of storage space. The Rustic X console is inspired by a Pottery Barn console and is mostly made up of 2x4's, making it a fairly simple and affordable project. There's a shopping list, tools list, cut list, and general instructions along with lots of diagrams and photos. There are also user photos to show you how a few simple changes in finishing can really change the look of the console. If you need to have your TV in the corner, this corner media center plan from Rogue Engineer will help you get it there in style. There are two long shelves with storage along with decorative X's on the sides. Depending on your choice of finishes, you can make this look rustic or contemporary, and everything in between. You'll feel confident diving into this project with lists for required tools and materials. Diagrams and written instructions will help you with every step of this project. Here's another corner media stand plan, this time for Ana White. It's a tall TV stand, making it the perfect choice for a large room with an awkward layout or a bedroom. There's a shopping list, general instructions, and dimensions to help you build this TV stand. There are also lots of user photos and tips and tricks to get you just the look you want. Here's another free DIY TV stand plan from Build Something designed by Home Made by Carmona. This is a great project for the beginner because it's a simple but great-looking stand for your living room, rec room, or bedroom. It's a simple design with X frames on the side and a large open lower shelf. There's a tools list, materials list, parts/cut list, and directions with color photos to help you with this build. Homedit has an even simpler plan for a TV stand that's built with large boards and galvanized pipes for the legs. The design really gives it a great industrial and rustic feel without being too heavy. Plenty of color photos and step-by-step instructions will take you through the building process so you can get this versatile TV stand that you can use anywhere in your home. 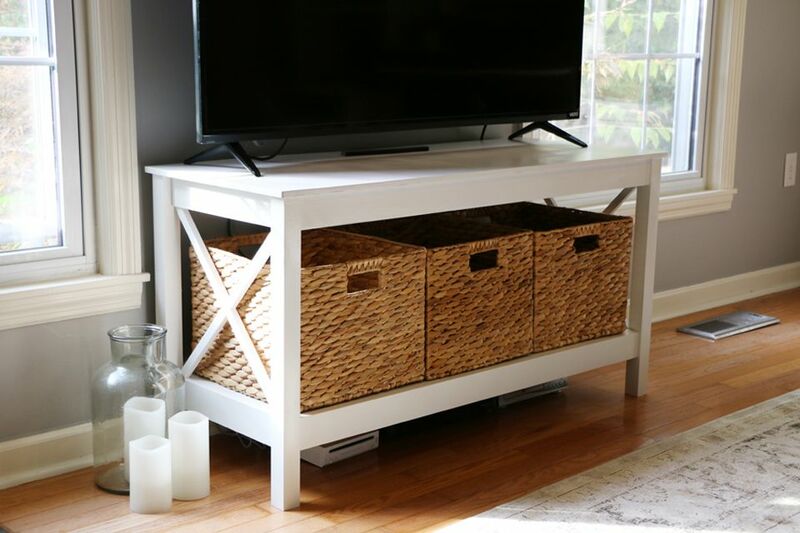 Create a stylish and budget-friendly TV stand with this free plan from Preparing for Peanut. Using one pallet, some stain, and a few hairpin legs, you'll have an awesome TV stand that will fit in even the smallest of spaces. Lots of color photos and written instructions will help you succeed at building this easy TV stand that's great for the beginning DIY'er. This easy to build TV stand has plenty of open storage with different sizes of shelves and has a large enough top to hold a big screen TV. You'll find written building instructions along with diagrams and shopping lists for tools, materials, parts/cuts. This rustic meets industrial DIY TV stand combines reclaimed wood and black metal pipe to make a one-of-a-kind piece for your home. There are a supplies and cut list, color photos, and building directions for this TV stand that will come together in no time. This free TV stand plan offers a unique solution to an oddly shaped living area where you have no choice but to have a view of the back of the TV. There's a lot of detailed photos and instructions here, with even directions on how to add your own mood lighting.